Tired of having the standard Andromeda Galaxy wallpaper on your Mac desktop and not a fan of Apple's built-in desktop image options? On Tuesday, Apalon released Pimp Your Screen for Mac, an app that lets you outfit your Mac desktop with a custom look. 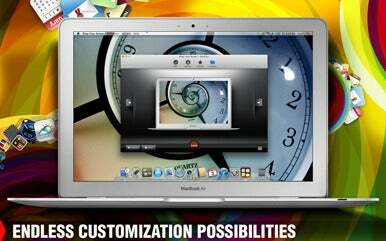 Originally released for iOS devices, Pimp Your Screen lets users customize their Mac desktops by providing them with custom images and wallpapers created by a team of professional designers. Wallpapers include everything from photos of tropical sandy beaches to kittens to whimsical abstract designs. Mac users can browse through available images in a similar way as they would on the iOS version of the app — you find wallpapers through eight different categories including Abstract, Cartoon, Holidays, Sci-Fi, Animals, Sport, Nature, and My Images. My Images allows users to create their own personalized collection of wallpapers. The app also regularly update with new content, which can be found in the New tab. Like in the iOS app, you can preview what your background image will look like before saving it. Once you've chosen a wallpaper, you can choose to share your desktop look via email or Twitter. Version 1.0 of Pimp Your Screen is available in the Mac App Store for $3 and is compatible with Mac OS X 10.6 or later. The app supports all available screen resolutions.